The sturdy, medium-sized Field Spaniel dog breed was originally developed to retrieve game from land or water. Today, while he retains his excellent hunting skills, he is mainly a family companion and show dog and is rarely seen in the field. He loves people and is a loyal family friend. The Field Spaniel, also known as the Field, is a breed of dog in the Sporting Group. Known for their grace and agility, this breed is just as famous for their calm and steady personality. 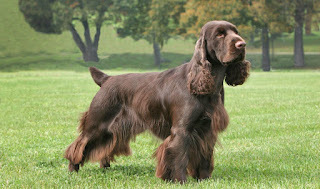 The Field Spaniel was recognized by the AKC in 1894 and AKC approved in 1998. 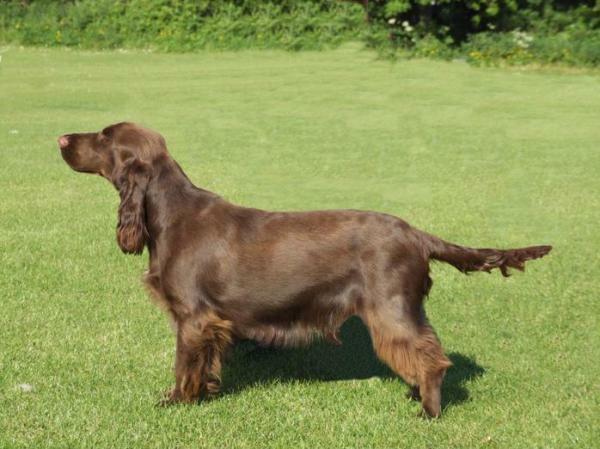 The average Field Spaniel stands 17 to 18 inches high at the shoulders and weighs between 35 and 50 pounds. 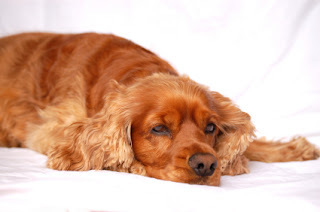 Unlike many Spaniels their short coat is easy to care for, but their long floppy ears need to be cleaned on a regular basis and frequently checked for any signs of bacterial or fungal infections. Field Spaniels need regular contact with people; they become neurotic if locked away in a kennel or out in a yard with no human companionship. Socialize them well when young to avoid timidity and problems with other dogs. They are active dogs and require regular exercise. They will follow their nose so a securely fenced yard is a must. Field Spaniels love water and will play in any water they find, including their water bowl in the house. They will share the fun by bringing the water to you also. They love to eat and will steal food when possible. The Field Spaniel is a little bigger than the English Cocker and a little smaller than the English Springer. The Field Spaniel’s slightly wavy, thick coat can be black, liver, golden liver, roan, or any of those colors with tan points. The Field Spaniel was developed in England in the latter half of the 19th century to be a medium-sized, all-black dog, which was unusual at the time as most hunters preferred dogs with some white so they could be easily seen in the field. 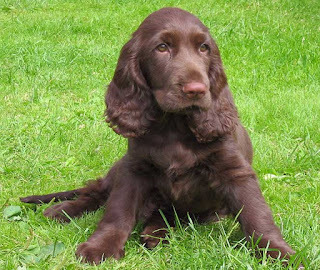 The Field Spaniel was created at the same time that dog shows were becoming popular and is considered the first spaniel developed for conformation showing while at the same time retaining his excellent skills in the field. Until 1901, spaniels were divided by weight, so if one puppy in a litter grew to be more than 25 pounds, he was called a Field Spaniel. If he weighed less than 25 pounds, he was classified as a Cocker Spaniel. Ch. Clareholm Dora, Best Champion at Crufts in 1909. The breed started out as a popular dog, but through some not-so-successful cross-breeding, fanciers turned him into a dog that was longer than he was tall, with short legs, a large head, and too much coat. That didn't make for a very good or very attractive hunting dog, and the public expressed its displeasure. The Field Spaniel's popularity bottomed out. Fortunately, a man named Mortimer Smith made the effort to bring back the Field Spaniel's functional good looks. 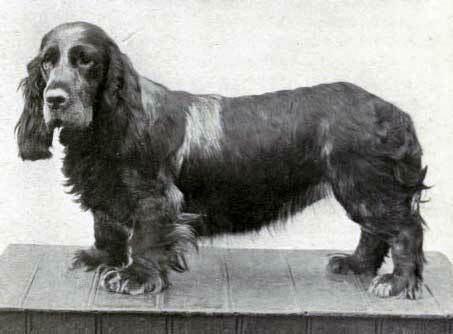 The AKC registered its first Field Spaniel, Colehill Rufus, in 1894, but when a fire destroyed a major kennel in 1909, the breed practically disappeared in the United States. The last registration of a Field Spaniel occurred in 1930. The next importation of Field Spaniels occurred in 1967, and those three dogs along with subsequent imports are the basis of the breed today. Despite his fine qualities, he remains a rare breed compared to other spaniels. 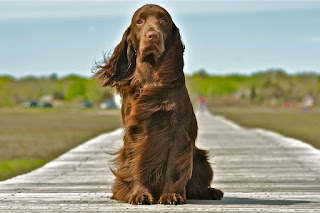 Larger than a Cocker Spaniel and smaller than a Springer Spaniel, the Field Spaniel is a medium-sized bundle of energy. 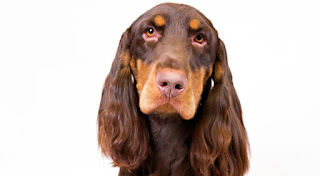 They have steadier temperaments than their spaniel counterparts and are generally friendly to everyone, even though they are usually not outgoing. They love the outdoors and are at their happiest when involved in family activities such as swimming, hiking, biking and hunting. They are incredibly agile dogs, allowing them to maneuver quickly in heavy brush and marsh to flush birds from their hiding places. Field Spaniels love people and consider all members of the family to be best friends. They also love water and have a reputation for creating quite a mess with their water dish, splashing around as if it is a tiny wading pool. Their temperament, trainability and patience with children makes Field Spaniels make an excellent choice for a first time dog owner, if that person is committed to an active lifestyle. The Field Spaniel, which has an average lifespan of 12 to 14 years, may be prone to minor health issues such as hypothyroidism and otitis externa, as well as seizures, heart murmurs, canine hip dysplasia, and patellar luxation. To identify some of these issues, a veterinarian may recommend heart, hip, thyroid, elbow, eye, and patella exams for this breed of dog. The Field Spaniel should be brushed and combed at least once or twice a week. Show dogs, meanwhile, must be trimmed and clipped on a regular basis to prevent outgrowth. A Field Spaniel's ear should be protected against the accumulation of dirt. Moreover, the inner ear hair and footpad hair should be clipped regularly. Regular exercise and training is recommended for the Field Spaniel. The breed should be allows to live inside the home, with access to the outdoors. But beware, some Field Spaniels are prone to snoring. The Field Spaniel is not recommended for apartment life. They are moderately active indoors and do best with at least a large yard. Because these dogs do have deeply rooted hunting instincts, it is essential to have a good fence surrounding your property, as otherwise they are likely to take off after any interesting scent. Do not lock this breed away in a kennel or it will become extremely neurotic. This breed prefers cool climates. Field Spaniels, like other accomplished sporting breeds, can have an independent streak which can sometimes present training challenges. They like to do things their own way, however with enough treats and praise on hand to reward good behavior, Field Spaniels can be trained with moderate ease. It is best to do the training in short spurts, so that the dog doesn't become bored, and should always be conducted with a gentle hand. Field Spaniels won't respond to discipline or harsh treatment. Field Spaniels were not meant to be lazy house pets. Their medium size might make them appealing to apartment and condo dwellers, but that living situation would be quite unfair to the Field Spaniel. They are active animals who love being outdoors and need time to run every day. Sending them out in the yard to run around isn't going to cut it, however. Instead, this breed should be involved in interesting activities that involve humans. Biking, jogging, hiking and swimming are high on a Field Spaniel's list of fun activities. Agility and obstacle courses are even better, and if possible, hunting is the Field Spaniel's favorite activity. Their agile bodies and webbed feet makes them exceptional bird hunting companions. They can flush birds out of their hiding places without being detected, and they can efficiently retrieve a hunter's prize from the water. If a Field Spaniel does not get enough activity they will become anxious, and that anxiety can often be severe. Destructive behavior in a Field Spaniel is almost always related to lack of adequate exercise. The Field Spaniel has a single coat, meaning there’s no undercoat. The silky hair is moderately long and can be flat or slightly wavy. The front of the chest, the belly, the backs of the legs, and the rear end all have feathering like that seen on the Setter breeds. The coat isn’t heavy and it’s easy to maintain. Brush it weekly and comb out the feathering a couple of times a week, or whenever the dog has been outside or has twigs or other debris clinging to his hair. Trim the hair between the footpads and inside the ears. Bathe the dog only as needed; regular brushing should keep him pretty clean. Field Spaniels shed moderately. If you plan to show your Field Spaniel, ask the breeder for advice on presenting the dog in the show ring. He should look natural, but he may need a little more neatening with clippers, thinning shears, and stripping knives than a pet dog would receive. The rest is basic care. Trim the nails as needed, usually every few weeks. If your Field Spaniel loves to swim — and even if he doesn’t — keep the hanging ears clean and dry to prevent bacterial or yeast infections. Brush the teeth frequently for good overall health and fresh breath. Field Spaniels are fond of children, but noisy roughhousing isn't their style. As with any breed, always supervise the interaction between Field Spaniels and young children to prevent any ear-tugging and tail pulling on the part of either party. In the United States, there were no Field Spaniels until the 1960s. The Field Spaniel Society of America was formed in in 1978.